Shipping is via USPS. Additional fees will be charged for orders outside of the US. Look for sales on select items each month. Click cart when you are ready to check out. This CD is dedicated to the Goddess Sekhmet. It includes Kemetic prayers, chants and a guided meditation. The CD features a heka (chant) by Baba Heru Semahj. The Ra Sekhi family are included with Rekhit Kajara Nebthet, Tchyia Amet and Jonathan Santos. 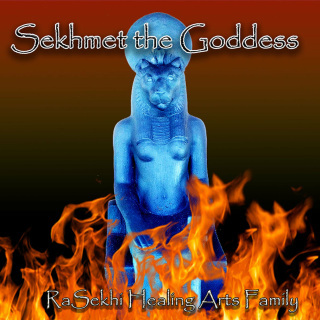 Sekhmet is the Kemetic (Egyptian) Goddess of Healing and Power. She is the Destroyer of Evil and the Keeper of the Divine Laws. This Poster has some of her praise names listed and would be a perfect edition to your altar or sacred space. It is 16 x 20 inches with blue background. Sekhmet is the Kemetic (Egyptian) Goddess of Healing and Power. She is the Destroyer of Evil and the Keeper of the Divine Laws. This Poster has some of her praise names listed and would be a perfect edition to your altar or sacred space. It is 16 x 20 inches with yellow background. For Kemetic Reiki Level 1 check out our ebook page. This book features stories, prayers, rituals and all things you need to know about SEKHMET The Great Mother Healer and Destroyer of Evil. With full color pictures. I have "Sekhmet Rising" and it's right on time! Reading "Our stories of Sekhmet" is bringing more clarity to some of my recent past dreams. Offerings, recipes, rituals and all the knowledge in this book is appreciated. Medase Mwalimu Baruti for recommending and Medase. Kajara Nia Yaa Nebthet and all involved with Ra Sekhi Arts Temple for dedicating this book "to the fiery ones, the healers, the activists, the righteous-the Daughters ans Suns of Sekhmet"
I Get Energy from the Sun is a beginning guide to teaching children about spirituality and the unseen beauty that lies within. It all begins with the sun. That ball of fire that nourishes unceasingly. This children’s book teaches how all living things use the Sun’s energy and introduces the youth to the mysteries of the energy around them known as the aura, the life force vessels within them known as the chakras and the powerful energy that they are by just being humans with the power to love and share - Sekhem. We are having a special on our children's books. You can buy all three books now for only $30. You will receive I Get Energy from, Light as a Feather and I am Mind, Body and Spirit. Offer good in US only.